In this episode I speak to learning video expert Jeff Long about some simple tips any of us can adopt that will make a big difference to the quality of our learning videos. Jeff also offers a discount to Trainer Tools listeners for his online learning course coach masterclass programme, find out more on the podcast! Simulations can be an enjoyable and effective part of that … if they are well-designed! Dr Nanette Miner believes that many companies risk going out of business within the next fifteen years because they have failed to train people to be leaders. She works with organisations to help them plan for the long-term, investing in their people to build business acumen and thinking skills, so once they reach leadership positions, they are in a position to guide the organisation successfully. In this podcast, I chat with Nanette about her thinking, the learning pathways she recommends and what sits behind her big scary claims. Nanette Miner is a leadership development and workplace learning strategy consultant. She is the founder of, and Managing Consultant for, The Training Doctor … read more about Nanette here. Alex Swallow is The Influence Expert– helping high achievers grow their influence to increase their impact on the world. He is currently a digital nomad – living and working in a number of European cities (and soon, India) with his wife. … read more about Alex here. Paul said he wanted to talk about “involution”. I had no idea what he meant, but I was willing to along with it because Paul Levy tends to have interesting things to talk about. Involution means the opposite of evolution. If evolution is about the fittest surviving, about decisions being taken by those who show up, about rewarding winners, then involution is about taking the time to look at those ideas and content that didn’t make it, those people who aren’t there … and reflecting on what that tells us and what value we can get from them. It’s a useful technique in brainstorming in particular, but also in the facilitation of meetings and decision making, as well as part of “the humble facilitator’s” approach to training and other learning workshops. A lot of learning and development content is generic off-the-shelf stuff, built on shaky foundations and of variable value. Many mainstay models and theories that pepper workplace learning are not robust, not subject to the rigours of research and peer critique, and often not supported by evidence. This doesn’t mean they’re useless: they’re not (well, some are). They have pragmatic value in that they work sufficiently well to survive and are often good conversation starters, but if we want the L&D business to be a serious profession, having a more scientific approach to research and the development of theories and models would be a good place to start. In this episode of the Trainer Tools podcast I talk to Dr Adam Le Nevez about how we might apply academic rigour to the world of L&D. 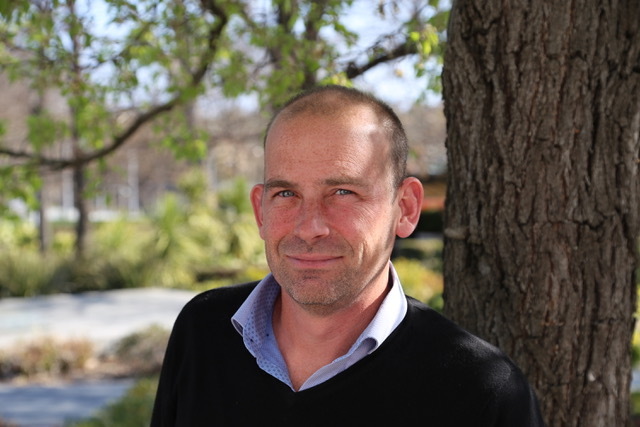 Adam Le Nevez is a learning consultant for the UK Foreign Office’s Diplomatic Academy. This doesn’t mean he teaches diplomats to unwrap a Ferrero Rocher in one hand while holding a glass of Champagne in the other. Rather, he partners with designers, faculties, learners and subject matter experts to build practical, innovative and accessible learning experiences for the continuous professional development of staff in the UK’s global network of missions … read more about Adam here. This is from 2015 too, and a deceptively useful model for having skillful conversations in facilitated sessions, coaching or even real life! In this Trainer Tools Essentials episode, I talk to Catherine Thomson about David Kantor’s theory of Structural Dynamics. In the podcast, Catherine explains how this theory of communication is applied to conversations in training and coaching. Catherine Thomson is founder of The Houston Exchange and is also an Associate Consultant within the People and Organisational Development (POD) Division with Edinburgh Napier University … read more about Catherine here. 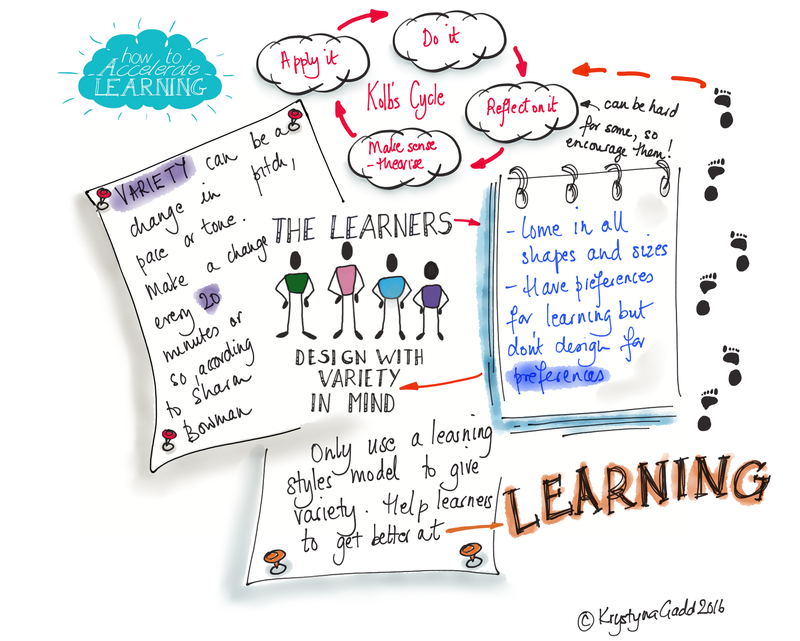 A while ago Krystyna Gadd presented her Five Secrets of Accelerated Learning and after that we decided to break it down to discuss each of the five “secrets” in a lot more detail. In this podcast we look at the third golden nugget of essential advice “design with variety in mind”. We discuss various models you can use to ensure workshops are designed with variety, including David Meier’s accelerated learning cycle as an overall structure, and many others. Here’s the link to Krys’s 100 Ways of Learning YouTube series mentioned in the podcast, and to the Center for Accelerated Learning (David Meier’s website). How do you trust your own internal feedback when all your clients think you’re great (but you only have a happy sheet). We recorded something that touches on the first part of this with Claire Simmons (called “Training can be a tough and lonely business, so look after yourself“) but I thought we could dig deeper and so I asked Paul Tizzard, someone who has worked as both an internal and external consultant, to have a crack at providing some sage advice. Paul Tizzard has been a professional trainer since 1996 and independent since 2001. He is a trained presenter, coach and facilitator. Since becoming independent, he has been fortunate to work in many different countries with an eclectic range of industries and companies. … read more about Paul here. A few months ago we chatted with Krystyna Gadd about her Five Secrets of Accelerated Learning, and then we talked about the first of those secrets in What’s your objective?. In this latest podcast we drill down into the second secret: be a facilitator and not a trainer. 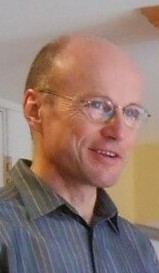 The guest theme tune (“Conversations”) is by David McGinty. Do we need a new name? I am thinking of changing the name of this podcast. We’ve outgrown the original idea of this being only about training room techniques and activities, and it’s evolved into a more general discussion about all things related to learning and development. I’d also like to try to bring change management into the fold – I’ve long had this idea that change management is not so different from L&D, I think of it being the plural of L&D, and a lot of the ideas and techniques are complementary. Despite our best efforts, our thorough preparation, and our fantastic facilitation, sometimes training programmes don’t go as well as we hope. Sometimes people turn up with quite different expectations of what the event is all about, or they feel like political prisoners who have been coerced into attending by managerial pressure, or perhaps they are seeking to spend a day playing with their phone instead of working! In this podcast Sunita Sehmi talks about her approach of engaging before, during and after the programme to ensure that the event is as successful as possible for the organisation and for the individuals who attend. Hi I’m John, and I’m biased. I am not the only one. You are too. In fact all human beings are born with a set of biases and mental shortcuts that help us survive and deal with the world around us. In the past such biases were vital to survival. We didn’t need to worry about being fair and inclusive when we were living in caves; we were more concerned with finding the next woolly mammoth and avoiding being eaten by lions. Issues such as creating a diverse community were way down our priority list. Times have changed. Now we live and work in a multicultural global environment and need to broaden our vision beyond our own narrow bias-filled perspectives. This isn’t easy, and in fact a lot of biases will persist even if you are aware of them and intellectually believe they are wrong … but we can only manage what we’re aware of, and in this podcast we discuss what unconscious bias is and how as learning and development professionals we can improve our understanding of our own biases in order to improve our performance. Link to unconscious bias resources and links. What convinced me was partly personal – I felt it offered valuable insight into my own self (not a pretty sight) – but also because of the impact I’ve seen it have within the training room. I’ve used it mainly for leadership development, so that’s my main experience, and I’ve seen many people (not everyone) find it really useful in not only raising self-awareness, but more importantly giving them a roadmap for strengths development that remains true to their authentic self. It’s another long one, but it’s good stuff. Here’s a link to the visual SDI material, including an index so you can see when we talk about each part of the theory in case you need to revisit parts of the podcast. Simon Gallon is the Managing Director of PSP UK (Personal Strengths Publishing) and a member of PSP Inc.’s Board of Directors and is an expert in the application of all SDI (Strengths Deployment Inventory) related products and services … read more about Simon here. I’ve never been a big fan of SMART objectives. I accept there is wisdom in the acronym, but I think the process tends to eclipse the most important things about performance objectives: they should provide clarity, challenge and motivation, and when delivered they should add value to the organisation. I made this point in a previous podcast (The secrets of accelerated learning: what’s your objective? with Krystyna Gadd) and was contacted by Garry Platt who disagreed with some of what I said and wanted to mount a defence of SMART. So that’s what this is … an extra podcast challenging some of the content of the previous one, with a screeching parrot in the background. Here’s a link to Garry’s SMART objective descriptions. Here’s a post I wrote a while ago on this topic: SMART objectives can be really DUMB. Here is a link to Garry’s podcast on an alternative to SMART objectives for circumstances that don’t fit well with SMART. 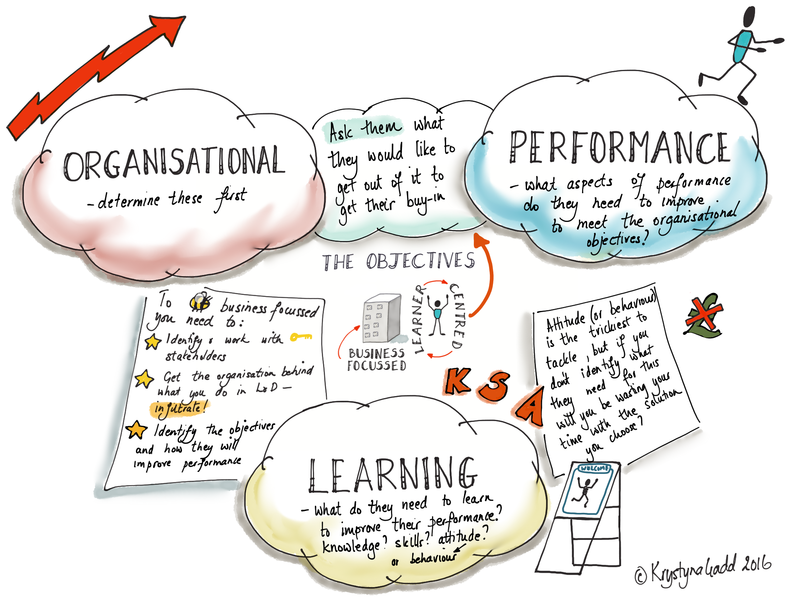 The secrets of accelerated learning: what’s your objective? A few months ago we chatted with Krystyna Gadd about her Five Secrets of Accelerated Learning, and in this podcast we drill down into the first and most important of those: writing learning objectives that link to the business strategy and the objectives of the learners. A good learning objective isn’t about restricting flexibility or limiting exploration, it’s about providing focus: answering the “so what” question before it’s even asked. Apologies that it’s a bit long, but when you get talking about this sort of thing it can be hard to stop! In this episode Garry talks about “Transaction”, and this builds on the first podcast “Transactional Analysis for trainers (part one): understanding ego states” that you should check out before listening to this. It’s been a while since we did a short episode and I’ve had this one in the can for a while, so I thought I’d edit it up and put it out. In this episode, I welcome back Seema Sarawgi who talks about a simple way to split larger groups into smaller sub-groups for activities. There are lots of ways to do this that are more interesting than saying “1, 2, 3” that can be fun and energising, can break down barriers and can lead into content or fit with teambuilding themes. Seema Sarawgi is a Learning and Development professional with around 8 years of experience of working with both public and private sectors in India and the UK … read more about Seema here. Training can be a tough and lonely business – so look after yourself! There’s a lot of travel, but that just means a lot of time in airports or stuck on long and boring motorways. L&D professionals don’t typically travel in hot air balloons with personal menservants called Passepartout – the budgets rarely stretch that far. It’s not just the solitude of travel, it’s the loneliness of being in a group of learners in a workshop, but needing to keep distant from them. We encourage social learning and network building, but we’re the guide on the side not another member of the gang. Often we’re associated with change, and change is sometimes bad news, at least for some of the people … and even if not, we’re in the business of challenging people, pushing them out of their comfort zones, perhaps even asking difficult questions that make people think. We might even cause all sorts of trouble by demanding manager involvement or by challenging cultural aspects that might be getting in the way of learning. Claire Simmons is an expert in offering career advice – and not just how to make your CV look nice. Her organisation (newfuture.me) works with people on personal wellbeing and the emotional side of career change, redundancy, and picking the right options for the future. Time is running out and you’ve got so much more content to squash in to the training course … what can you do? Easy, just drop the action planning session you have penciled in for the end of the day! In this episode – the longest Trainer Tools podcast by a country mile – Emma explains how action planning done well can be the key tool in ensuring knowledge and skill acquired on a training course is transferred into the workplace and drives real life proper performance improvement! Maybe I should have split this up into two parts, but there didn’t seem to be a natural break … so I didn’t. I know it’s long, but I think it’s worth it! Emma Weber is the founder of Lever – Transfer of Learning and developer of the Turning Learning into Action™ (TLA) methodology. Emma’s firm belief, and the platform on which she has built her successful global business, is that the key aim of learning in the workplace is to create tangible business benefits … read more about Emma here. I am not the world’s best at planning, and probably wouldn’t rank very highly at following a plan either. I’ve often felt that this was a weakness – I know it’s also a strength (I am good at thinking on my feet and coping with change), but it’s also true that it mightn’t be such a bad thing to plan ahead and perhaps stick to a schedule every now and again … so, when Paul Levy proposed talking about the role of improvisation in training delivery, I was rather excited! In this podcast he talks through his approach to improvisation, what it means, how we can develop the skills, and his own examples of improvised activities that have worked well, and – because it’s in my nature to ask – times when it hasn’t worked so well! Here is the link to the Applied Improvisation Network as mentioned in the podcast. Evaluation is the most neglected part of the L&D cycle. My guess is that this is because most people in L&D prefer to be in training rooms or designing workshops, or creating transformational strategies to allow individuals and organisations to reach their potential … I’m getting carried away now … the point is that few of us get excited about the subject of evaluation. Merle Van Der Voorde was no exception, and wasn’t exactly thrilled when asked to deliver an evaluation project for the various learning and development courses, programmes and other activities on offer. However, like most things, the more you know about them, the more interesting they become and in this podcast Merle shares the strategy and approach she used, and talks through some examples from her organisation. Click here to see the training evaluation resources mentioned in the podcast. Stories are the oldest and best way of passing on information in an engaging and memorable way. They are a key tool in learning, and a nice break from PowerPoint and flip charts, and they can be used to make things easier to remember, to raise a particular issue for discussion, to challenge the way people think, and to make learning easier to transfer back to the workplace. We don’t need to rely solely on real things that have happened either – although real life stories are really good – we can write our own stories too. Sometimes this might be because we don’t know a relevant true story, but often there is value in an obviously fictional account – think how much we call on famous fictional situations as real-life metaphors now: everything from Shakespeare and Star Wars to Monty Python. Fictional stories can be used to illustrate ideas in a meaningful way that everyone understands. In this podcast I talk to Samantha Mathis about her use of stories and how to write your own stories for training courses and other learning events. She also talks about using storytelling as a powerful teambuilding activity, allowing teams to raise and discuss issues in a fun and engaging way. Samantha Mathis is Regional Head of Learning & Development for the Americas region for the UK Foreign & Commonwealth Office. She has more than 15 years experience in leadership and learning and organizational development to realize improvement and change … read more about Sam here. Accelerated learning is a term that is oft heard, but not oft understood, and even less oft applied effectively. It’s not just about playing some music, putting a load of fiddly toys out, and then forcing delegates to flip chart stuff for hours, there’s more to it than that. In this episode, I talk to accelerate learning expert Krystyna Gadd about her five secrets of accelerated learning: five areas that need to be considered to ensure that a learning event takes full advantage of all the benefits that accelerated learning can bring. The only problem is that we went on too long, so I decided not to inflict an hour-long podcast on the poor listener, and instead split it into two halves. With so much great content available freely online, why would anyone bother paying for a training course? It’s almost like people can go round learning stuff, willy-nilly, without us learning professionals getting involved at all! Obviously that would never do, so what can we do to rise to the challenge of technology? In this episode of the Trainer Tools podcast, I talk to Larry Reynolds about his ideas for the future of the training facilitator, including his experimental use of social networks and online communities to help reinforce learning. In this short extra episode of the Trainer Tools podcast series, I talk to Seema Sarawgi about a simple but effective technique she uses in teambuilding events. The Paper Tower is very simple to prepare for and run, and can be used as a quick way to get people talking and moving about, or to develop deeper learning around teamwork, planning, communication and leadership in the context of the organisation. Some things come up again and again in learning needs analyses, whatever the organisation, whatever the circumstances, and “assertiveness skills” (or something similar) is one of those things. It crops up in the middle of loads of different structured training courses, it forms part of many coaching relationships, even pops up on teambuilding workshops from time to time. It seems like many of us human beings just aren’t naturally that great at being assertive in a positive way, we tend to be either naturally passive or naturally aggressive, and struggle to calibrate assertiveness correctly. In this episode, Kevin Stephens talks us through his approach to running an assertiveness workshop. As always with Kevin, it’s a very practical and active approach that I hope has some good ideas for others facing the same learner needs. Kevin Stephens is a Learning and Development practitioner who specialises in helping people get the most of their working relationships by delivering bespoke management and leadership programmes. He has a large well of experience, gained from over 20 years working in senior management … read more about Kevin here. Many managers are keen to create great teams, and there’s no better way to do this than ask someone from the training department to come along and deliver a teambuilding day! This is true of internal and external training providers equally, and although a teambuilding session can be truly effective and a lot of fun, it can also be an enjoyable waste of time, or even a total disaster. In this episode of the Trainer Tools podcast, I talk to Paul Tizzard, author of The Teambuilding Pocketbook, about his approach to teambuilding events and how to make sure they are valuable, effective and fun. (Click here for more information on Belbin’s Biscuits – discussed at length during this podcast. Most of us working in learning and development get involved in training delivery. This usually involves a bit of teaching and a lot of facilitation. We work this out over many years. Maybe we start by giving PowerPoint lectures, and only over time, as we learn more about our craft and gain in confidence, are we able to take a step back and focus on the process and a lot less on the content of training sessions. This is facilitation: the management of the process that allows learning and understanding to emerge from discussion, activity and feedback. I’ve been doing this for years, and I think I’m pretty good at it – but like many other trainers (or facilitators), I have no theoretical foundation to understand what I’m doing or how I could do it even better. In this discussion with Nick Eve, he explains the theory that underpins great facilitation, and shows how this leads to effective facilitation behaviours. Nick Eve specialises in developing people’s facilitation skills. His work is all about developing people’s ability to run groups professionally and effectively. He has been doing this since 1994. Before that he worked as a facilitator in organisational development. His fascination with groups and the role of the facilitator in enhancing their effectiveness has grown out of his own experiences, both with organisations and also from his group psychotherapy background … read more about Nick here. Cultural diversity can be a real minefield. It’s very easy to put your foot in it and say or do the wrong thing, making learners feel vulnerable and uncomfortable. It’s so easy to think of ourselves as culturally neutral, the normal one in the middle, but our own culture is stamped all over how we deliver training and the way we engage with our learners. There are many aspects to cultural identity. It could be about communication style, about different assumptions and understandings of appropriate respectful behaviour, about things that can or cannot be said, about approaches to issues like hierarchy, age and gender. People might find your carefully planned activities to be deeply inappropriate, or maybe they find it difficult to challenge others or be open to challenge themselves, making your heated debate segment fall a tad flat. All of this cultural diversity business puts a host of precarious obstacles in your way. You want them to engage with the course and the other learners, you want them to enjoy the experience, and of course (most importantly) you want them to learn. They won’t do this if they feel threatened, unsafe or insulted because of some avoidable mistake or miscommunication. Sunita Sehmi is an experienced coach and trainer with years of experience of working in a multicultural environment. In this podcast she takes us through her methods and top tips for handling cultural diversity in the training room. TT Shorts: The Clapping Exercise – an icebreaker that cures hair loss! I didn’t want to leave a big gap over summer, so I thought I’d chuck in another short podcast about a simple energiser, or icebreaker (it can be either, or both) that anyone can use on any course. It’s not just an icebreaker though, it also has positive health benefits (see here), including preventing hair loss! Something I wish I’d known about a few years ago. Seema Sarawgi explains how she uses this and how it’s a simple, fun and energetic way to start a training day. It is a rare performance management training course that doesn’t include the ubiquitous SMART acronym within it – and it is a rare organisation that doesn’t demand its people create a yearly clutch of SMART objectives to meet the needs of their performance management process. SMART objectives are often written to meet the needs of the process – not the people – they are written to fulfill the requirements of the clever acronym, but not actually to respond to the particular challenges of the individual job holder and their manager. This is a long-running bugbear of mine, and it was good to hear that one of this podcast’s great supporters and contributors, Garry Platt, had encountered exactly that problem during his consultancy work. As good as they sometimes are, often it’s just very difficult to write SMART objectives: it’s not only hard to articulate the specific behaviour, it’s next to impossible to create an appropriate measure that doesn’t just tot up something numeric that’s vaguely related (but not very important). However, we’re made of strong stuff on the Trainer Tools podcast, and just because something is difficult is no reason not to do it! So in this episode Garry talks me through his approach to what he calls behavioural objectives. Trying to SMARTify your objectives need never ruin your life again! Garry has also blogged about this on LinkedIn. R equals e to the power of minus t over s.
Or, to put it another way, people forget about 80% of what they learn on a training course. That might not be exactly true, Ebbinghaus’s research and “curve of forgetting” equation is not the most rigorous of science, but it’s probably true-ish and that’s good enough for this podcast! In this episode I talk again to Roger Greenaway, an expert in experiential and innovative training methodologies. We talk about what “learning transfer” really means, and then discuss some unusual and creative ways of designing training courses so that learning transfer is more likely to occur. The example Metaphor Map discussed in this podcast can be found here. Further materials about the content of this podcast can be found on Roger’s website here. Roger Greenaway is a specialist in making experience-based learning more participatory, dynamic and effective. He does this by training facilitators in the skills and techniques of active reviewing (debriefing), what he calls “the game after the game”. … read more about Roger here. Human beings need to feel comfortable to be able to learn. To feel comfortable within a group they need a sense of acceptance and control. To build rapport with other learners and the trainer, they need to go through rituals. Icebreakers can help us do that. However, they can also help us achieve the exact opposite. If they are not well designed for the course content and the group they can make people feel uncomfortable and wish they were anywhere else but in your training room! In this episode of the Trainer Tools podcast, I talk to Paul Tizzard, author of three books about icebreakers, about how to make sure they work! I thought it’d be a bit of fun to chuck in the odd short podcast at random intervals (this might stretch the definition of “fun” to breaking point) in a new sub-series of casts called TT Shorts. This is the first one, from our old friend Jon Kersey, and it’s a quick and easy technique you can use during teambuilding events. How we begin learning events is vital in setting the right tone for the day. To get the best learning, we want to create a creative a safe environment that is fun and allows for people to express themselves playfully, allows for mistakes, lets people feel that they can challenge and be challenged, and above all exposes the learners to views and perspectives different than their own. There is no one single magic bullet for achieving this, it’s done through lots of little things that together contribute to building that learning environment. In this (short!) episode I speak to Kevin Stephens about a simple technique he uses to kick off change management training. Kevin’s whole approach to training is to focus on creating the conditions for learning using accelerated learning techniques, and in this episode he introduces us to a quick and way to start that process off. Great training is built from many different component parts. It’s not just PowerPoint and flipcharts, or days of building bridges out of matchsticks and glue. Training is a mix of content and reflection, of channels and methods, carefully designed to keep energy and interest high, to be engaging and enjoyable, to challenge assumptions and make people think, and to give useful practical take-away actions that can be applied in real life. Stories are a useful addition to that mix. Stories are memorable, they’re fun, and they can be used to help break down barriers, build relationships between the trainer and the delegates, and to help establish credibility. In this episode of the Trainer Tools podcast, I talk to Larry Reynolds about three different ways he uses stories during his training events. Debriefing training activities is so important. The debrief is where the learning is explicitly discussed and related back to whatever models and theories are being used. It’s where people reflect and think how to apply the learning in their own workplace. It’s an opportunity to discuss and share experiences and opinions. Yet it’s often just a low energy plenary discussion that excludes most of the people most of the time. Useful, but a bit of a letdown after a fun and engaging activity. In this episode of the Trainer Tools podcast, I talk to Roger Greenaway about “Active Reviewing”, his method to not only keep the energy, enthusiasm and inclusion high during the debrief, but also to dig deeper and maximise the learning opportunities from training room activities. Roger has written an article “4 Active Reviewing Methods and the Active Reviewing Cycle” about this interview. In the eighth episode of the Trainer Tools podcast, I welcome back Garry Platt to begin a series of casts on his specialist subject: Transactional Analysis. We’re going to do a whole series on this because it’s such a broad and interesting topic, so this is just the start of something! In this episode Garry talks about “Ego States”, the first building block in understanding the theory. This is also really useful as training course content for courses on topics such as assertiveness and communication skills. How much effort we put into the very first part of training courses, in breaking the ice and building rapport, can directly impact the effectiveness of the rest of the day. This is especially true if you rely on input from learners and seek to create a social environment where people learn from each other, not just the trainer at the front. Jon Kersey always invests time here, more so than any other trainer I work with, and in this podcast he shares his three favourite techniques. Jon argues that the time and effort invested here pays him back in terms of quality of conversations – and therefore quality of learning – that happens in the room throughout the day. I don’t always agree with Jon on this one, I usually prefer to provide content input sooner, especially on shorter courses – but it would be boring if we were all the same! Most of how we engage with other people in the workplace, on training courses, or in coaching sessions, is based on having conversations. The quality of these conversation directly impacts our effectiveness, and as educators and coaches, our ability to have powerful conversations that help to create insight and learning is a huge part of how we succeed. In this episode of the Trainer Tools podcast, I talk to Catherine Thomson about David Kantor’s theory of Structural Dynamics. In the podcast, Catherine explains how this theory of communication is applied to conversations in training and coaching. 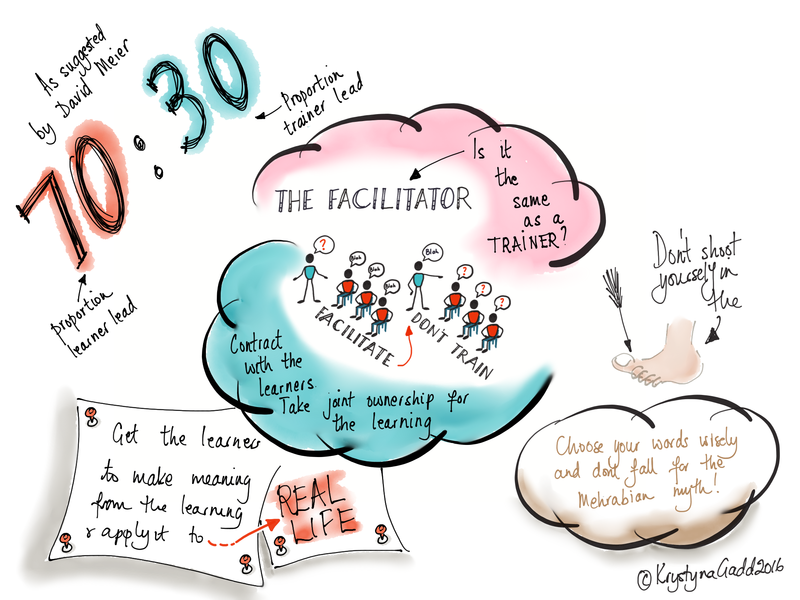 In this episode of the Trainer Tools podcast, I talk to Shirley Gaston about how to keep learners engaged throughout the training event. This is Shirley’s specialist subject, something she’s been passionate about for years, In the podcast she outlines three different approaches for ensuring the delegates on the course stay engaged. Shirley Gaston is the founder of the experiential learning company Azesta which has been developing people for 16 years. As such, she is one of the driving forces within the company. She values openness and this quality is intrinsic to her learning programmes … read more about Shirley here. In the second episode of Trainer Tools, I talk to Paul Levy about his “Collusion of Mediocrity” concept. This is an idea that can be used with both the Consultant and Facilitator aspects of the job, and is about pushing for real change in performance as a result of training interventions. It also has interesting impacts on how we evaluate the impact of training. Since releasing this podcast I have blogged about it on TrainingZone website: How you measure training success might be stopping you from succeeding.